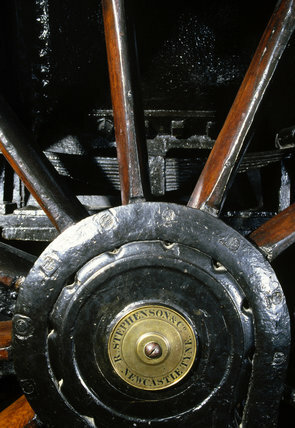 Driving wheel from the remains of the 'Rocket', 1829. The Rocket, designed by Robert Stephenson (1803-1859) and George Stephenson (1781-1848) became famous by winning the Rainhill Trials, a competition held at Rainhill in Merseyside in 1829, to establish the most efficient locomotive for railway haulage on the Liverpool and Manchester Railway. The Rocket subsequently ran on the Liverpool and Manchester Railway (1829- 1836) and the Midgeholme Colliery Railway (1836- 1840).